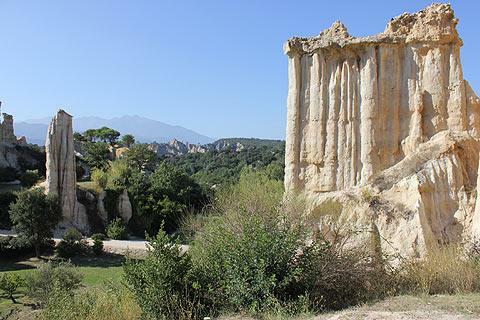 Ille-sur-Tet is a busy town in the Pyrénées-Orientales department to the west of Perpignan. 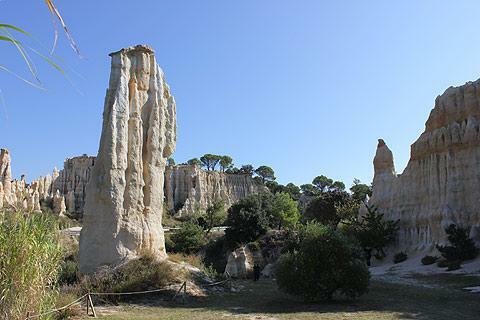 The town is usually visited because it is close to a wonderful natural rock formation known as the Orgues d'Ille-sur-Tet which are well worth a detour to see. France This Way comment: although mostly visited for the nearby orgues, there are also a few monuments of interest in Ille-sur-Têt town so we suggest you allow yourself time for a short stroll in the town centre. Ille-sur-Tet has had a turbulent history because of its position near the border with Spain. As the town developed three different rings of ramparts became necessary to contain and protect the growing population and various gateways, walls and towers of these original fortifications can still be seen. The town is dominated by its church, the eglise Saint-Etienne, and particularly by its bell-tower which rises up above the rest of the town. It is its size rather than any particular historic significance that makes the church stand out. The ancient hospital of Ille-sur-Tet, the Hospice d'Illa, was built in the middle ages for the sick and elderly of the region. The main facade of the building is in the baroque style, then inside a there is an exhibition of frescoes, statues and religious artworks from the Catalan region and in the roman and baroque styles to see. 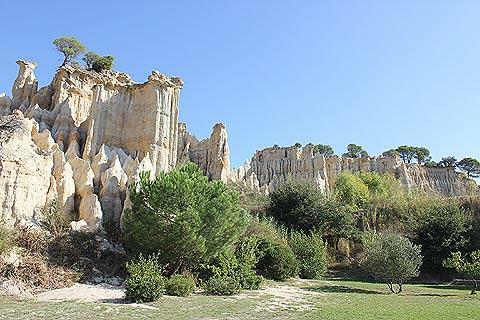 The main reason why people come to the town is to visit the wonderful rock formations just a few kilometers away. 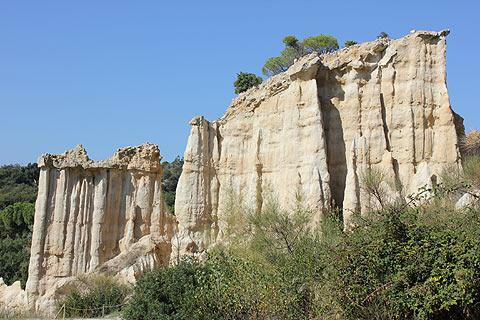 The 'orgues' as they are called form a kind of natural ampitheatre made of tall pillars of rock which have been eroded into wonderful 'organ-pipe like' shapes that stand up to 12 meters high. As well as the beautiful shapes of the rock they are all formed from a white sandy rock with regular layers of a yellow rock running through them giving them a pretty striped appearance. 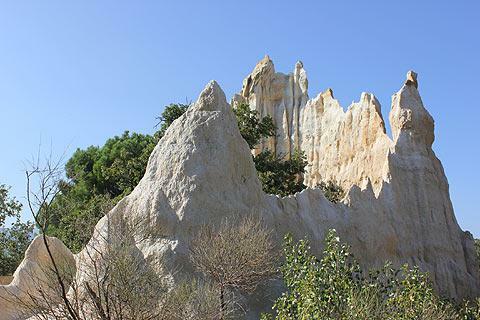 They are known as fairy chimneys or 'hoodoos'. Many are topped with scrappy-looking bits of rock and even some vegetation but in effect this is offering some protection to the more vulnerable rock below so is vital to the whole ecosystem. 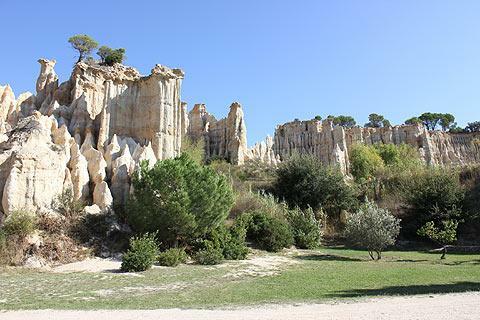 There is a short walk from the carpark to the entrance then a walk leads you around the small park allowing you to get some excellent views over the different formations. Each new view offers another beautiful scene. Its almost impossible to stop taking photos! The rock structures are fragile and the same weather that formed these wonderful formations is also gradually eroding them away. Lots of sand washes down from the columns each time it rains. France This Way comment: if you know the western USA, the site has something of a look of a miniature Bryce Canyon which is probably my favourite place in the world! Surrounding the 'orgues d'ille sur tet' the view opens up to mountains on three sides. To the south is the Massif des Aspres, to the south-east Mount Canigou, with its peak known as the tooth of a dog (dent de chien) - the highest peak of the Pyrenees Orientale, and to the north the granite plateau of Montalba. 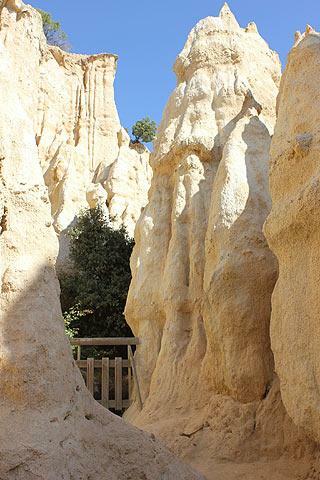 If you enjoy natural spectacles, we suggest you also travel south from Ille-sur-Tet for a walk through the deep chasm of the Gorges de la Fou. 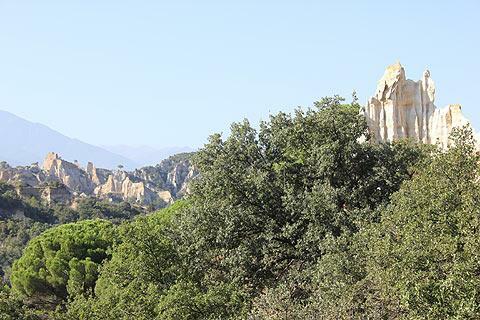 Our favourite walk near here is the trail that leads to the abbey on the slopes of Mount Canigou, which has beautiful views as well as a lovely abbey at the end of the path.